CURVE, Pa. - The Pittsburgh Pirates have today announced that Jameson Taillon, the second overall pick in the 2010 draft, is scheduled to be promoted to the Altoona Curve and make his Double-A debut on Tuesday, August 21 at Trenton. With the impending addition of Taillon to the Curve roster and Gerrit Cole already pitching for Altoona, the Curve will have the top two prospects in the Pirates' organization on their roster. Taillon, 20, is in his second full season in the Pirates' organization after being selected with the second overall pick in the 2010 draft out of The Woodlands (Texas) High School. In his first season at the High-A level, Taillon has gone 6-8 with a 3.82 ERA in 23 starts for the Bradenton Marauders of the Florida State League. In his 123 innings, he has allowed 109 hits while striking out 98. The Texas native was named a Florida State League Mid-Season All-Star during his time with Bradenton. 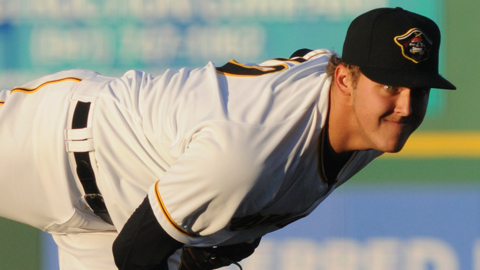 Taillon was also named a mid-season South Atlantic League All-Star in 2011 with Low-A West Virginia. In his first month of work in High-A, Taillon went 1-1 with a 1.46 ERA in five starts and in the process garnered his first career Pitcher of the Week award. From April 23-30, Taillon made two starts and combined for 11.0 shutout innings while striking out 10 and giving up just six hits. He recently added a second Pitcher of the Week award to his belt, this time for the week of July 30-August 6 as he again pitched scoreless baseball across two starts. This time, Taillon worked seven shutout innings in Lakeland on the 30th before throwing five scoreless at home versus Palm Beach to round out the week. Since the All-Star Break, the second-best prospect in the Pirates' system according to Baseball America has a 3-2 record and a 2.98 ERA in 10 starts. In three starts during August, he's 1-1 with an ERA of 1.80. In addition to his other accolades, Taillon was recently rated by the managers, coaches and scouts in the Baseball America Best Tools Survey as being the best pitching prospect in the Florida State League as well as having the league's best breaking ball. The6-6, 234-pound Taillon also participated in this year's SiriusXM Futures Game in Kansas City. Taillon is likely to pitch for the Curve at some point during their final homestand, which runs August 23-30, spanning nine games in eight days. For tickets and more information on the upcoming Curve homestand, call 877.99.CURVE, visit AltoonaCurve.com or stop by the box office windows at Peoples Natural Gas Field.